There are so many products. What one do I need? If you are unsure of the product that is best for you, check out our leather guide. 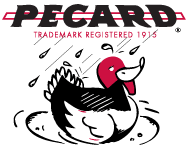 If you have questions the guide doesn’t answer, we’d be happy to answer your call at 1-800-467-5056 during business hours or through an email sent to info@pecard.com. Why are there so many products? Isn't all leather basically the same? There are several methods used to tan leather. The main difference is the way the leather is finished after tanning. Oil-tanned leather is treated with fat liquors to replace the oils taken out during the tanning processes. The oils dissipate over time so use the Leather Dressing or Boot & Shoe Oil to keep the leather soft and supple. Dry-tanned leather doesn’t have those oils put back in and most likely have a nap. To protect the nap, maintain the color, and prevent staining, use either the Silicone Protectant or the Suede & NuBuck Spray. Some leather has a sprayed on coating applied, this treatment would repel an oil or silicone product so the water-based Leather Lotion is needed. This is an important step to take before placing your order for a leather conditioner. It is common for upholstered furniture and automotive seats will have leather sitting areas but vinyl trim on the sides and other areas. This makes the job of identifying material a bit more difficult. First, leather feels soft, warm, and more natural. Vinyl on the other hand, feels colder, stiffer and artificial. This may be easy for some to determine the difference, but others may have a difficult time in making the decision by touch. One sure fire way of determining leather versus vinyl is to look on the under side of the material. Just lift up a small section and look at the back side of the material. If you see a cloth like material that appears to be glued to the backside of the fabric, then you are looking at a piece of vinyl. Sometimes this backing will be of a white colored “fuzzy: nature. Leather has no backing material of any kind, only a “rough” or suede looking texture. (Usually of the same color as the leather’s surface. If getting to the back side of the leather is unattainable, a scratch test and a water drop test will usually answer the question. If you can easily leave a scratch on the surface of the leather with your fingernail, you may have an oil tanned leather. If no scratch appears, it may be coated. For the water drop test, place a few droplets of water on the surface of the leather, after 30 seconds, wipe it away. Oil tanned leather will absorb the water or turn darker where the water was. Coated leather will roll the water off the surface and not soak in or turn darker. If you need further help, please call us at 1-800-467-5056. How much conditioner do I need? The quantity will depend on the age of the leather, the condition, and how much leather needs to be treated. If you have an older item that is really stiff and dry, a larger item, or a lot of leather to treat, we recommend getting a larger size. More than one application may be required until the leather is optimally conditioned. Maintenance applications are suggested every 4-6 months so with this in mind, consider the size you will need after the initial treatment(s). My dog or pet ate the dressing, what should I do? We usually receive a few phone calls a year regarding the family dog, and once in a great while a cat or other animal, haven eaten our Pecard’s Leather Dressing. We think perhaps the smell of the sweet beeswax is what attracts them. You do not need to induce vomiting. We do recommend keeping your pet outside or close to the door while the dressing goes through their system as they may have the runs for a day or two. Make sure to provide plenty of fresh water.